From greats like Patti Smith and Joan Jett to legends-in-the-making like Taylor Swift and Demi Lovato, girls want to rock. They want to start bands, write songs, get up on stage, and kick out the jams. Here's the book to teach them how. 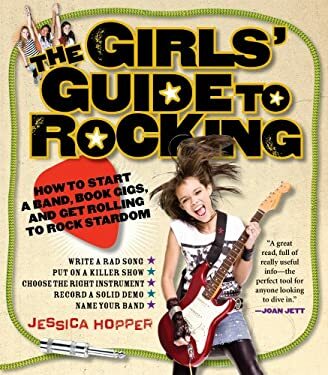 Written by an obsessive music lover who's spent her life playing, performing, publicizing, and writing about rock 'n' roll, "The Girls' Guide To Rocking "is a hip, inspirational guide for rad girls who want to make their rock dreams come true. It's everything a rocking girl needs to know: how to choose the right instrument for you, where to shop for instruments and where to avoid. How to get your band together and keep it together-tips on playing in a band with your friends and staying friends. How to turn your bedroom into a soundproof practice space. Giving your band the right name, plus a cautionary glossary of overused words (Wolf, Star, Crystal, Earth, etc.). How to set-up and promote your own shows. The freedom of going solo, and how to handle performing alone in the spotlight. Songwriting tips, with eight prompts to get the lyrics flowing. The ins and outs of recording, whether at home or in a studio. Taking care of business: publicizing your band, making T-shirts, legalese and the creative personality, and the four signs that say "time to hire a manager"-in other words, you've arrived. Includes a girls-in-rock timeline, essential listening lists, and quotes from the greats: Nina Simone, Hayley Williams, Gwen Stefani, Carrie Brownstein, Amy Lee, Kim Gordon, and more. Now get out there and rule the world.